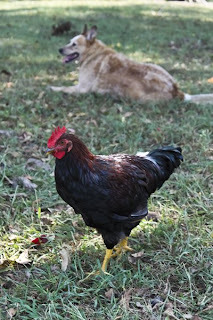 When we acquired Jock-a-doodle do (our lead rooster in residence), we acquired two gamecock hens as well. We had an issue with our Wyandottes refusing to go broody (which results in baby chickens that we want) and were told that gamecock hens were great mothers who could fix our problem. The plan was to wait for a game hen to go broody, replace her eggs with Wyandotte eggs while she was sleeping and presto...we'd have chicks in about 22 days. Well about 3 weeks ago our light colored gamecock hen went missing. We assumed that she'd been taken by some animal and let it go. 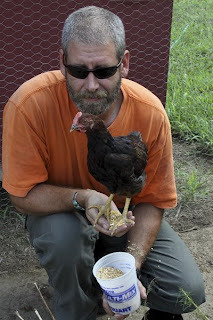 She'd generally kept to herself and didn't lay eggs in the coop anyway, so we didn't see it as a great loss. To our surprise, a few days ago the hen showed up again and wasn't alone. She had gone broody! 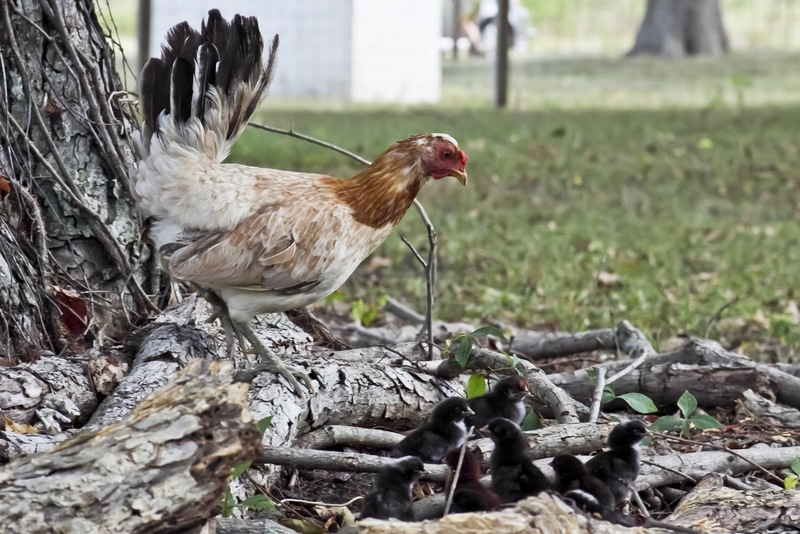 She had hidden herself and her eggs just under a wood pile near the chicken coop and had stayed out of sight until the eggs hatched. Yesterday I watched her march around the yard with nine gamecock/Dominique chicks in tow. 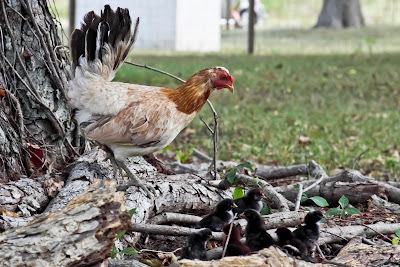 She is raising them with minimal human assistance (we throw her food when we see her) and is teaching the chicks to forage for food around the yard. So far they are doing great. They all sleep outside the coop at night though, so we are hoping for the best. As for our Partridge Rocks (the chickens we got to replace the Wyandottes), they are growing up fast and seem to be doing well. They are extremely friendly which is nice, but we didn't exactly get what we bargained for. We got a straight run of 25 and figured on at least half being hens. Instead we got 6 hens and a mess a roosters. Hopefully these hens will be good layers because our Wyandottes have given up laying altogether after only a year and a half. Scott sadly bought a dozen eggs at the grocery store last week. The first store bought eggs in over a year. So, we've got 6 potential Partridge Rock laying hens, 9 mystery chicks, several expired Wyandotte hens and way too many roosters. 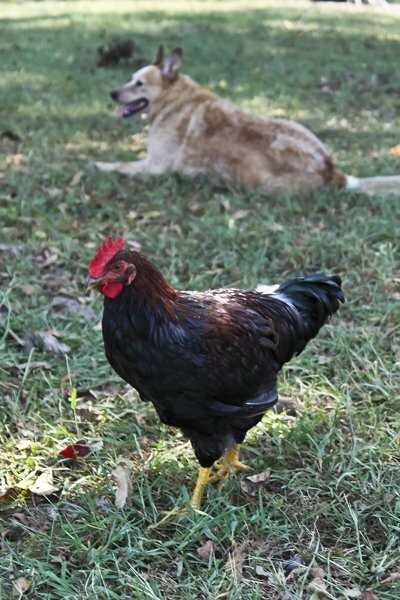 If anyone wants a old chicken or a Partridge Rock rooster, speak now! They're disappearing fast. When you live on a farm that raises free range pork, you gotta get creative about what you do with all of it. 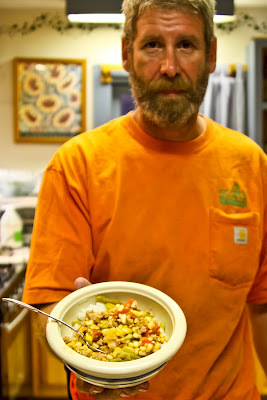 Scott's mama gave him the following recipe and it works great with our home grown and blended Guinea Hog sausage. Back to the recipe... fry the sausage in a pan, chop the onion and saute it in olive oil (our GH sausage isn't greasy enough to saute in! ), mix all the ingredients in a sauce pan, then simmer for about an hour. You can serve it as a stew or over rice like we do. Our secret weapon...Guinea Hog sausage of course, but also fish sauce on the rice. Substitute fish sauce for salt anywhere you want a rich, deep flavor and you'll be pleasantly surprised. Just don't sniff the bottle before using. Asian fish sauce reeks, but tastes wonderful if you use it sparingly. Belly up! Cold weather is coming. 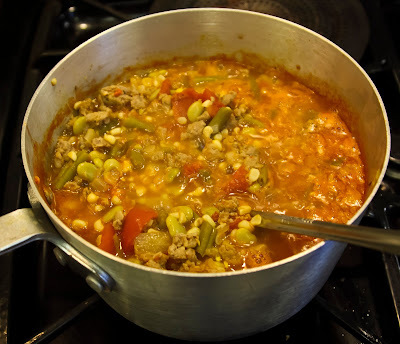 I know it is, I know it is (I keep telling myself that anyway) and this is a great cool weather meal. Enjoy.